Input a Guide and any number of Dub (input) tracks that are to be modified by APT processes at the same time. Example: The Revoice Pro Session shown below has 4 vocal tracks. 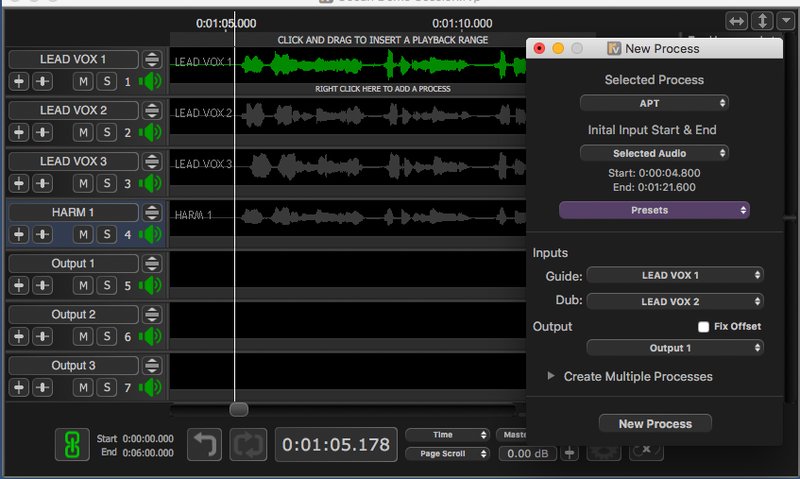 One Guide (Lead Vox1), 2 Dub tracks (Lead Vox2, Lead Vox3) and a Harmony (Harm1), plus a music backing track. TIP: If clipping is heard when playing multiple tracks simultaneously, set Revoice Pro's Master Volume control lower (e.g. to -6 dB). Create the Output tracks needed for the APT outputs (if they are not in the session). Each APT process will need an Output track. So in above example we need two outputs for the double tracks (Lead Vox 2 and 3) and one output track for the Harmony (Harm 1). And we want to put these vocal outputs above the Backing Track. TIP: The most efficient way to insert these Output tracks is to move the mouse to under the label HARM 1 and LEFT CLICK (to see the hand pointer) and then RIGHT CLICK to bring up the menu shown right and click Insert Tracks. That will bring up the New Audio Tracks windows shown below. Put the number of new (Output) tracks required (3) and type the desired name (with optional number) for the first Output track ("Output 1"). 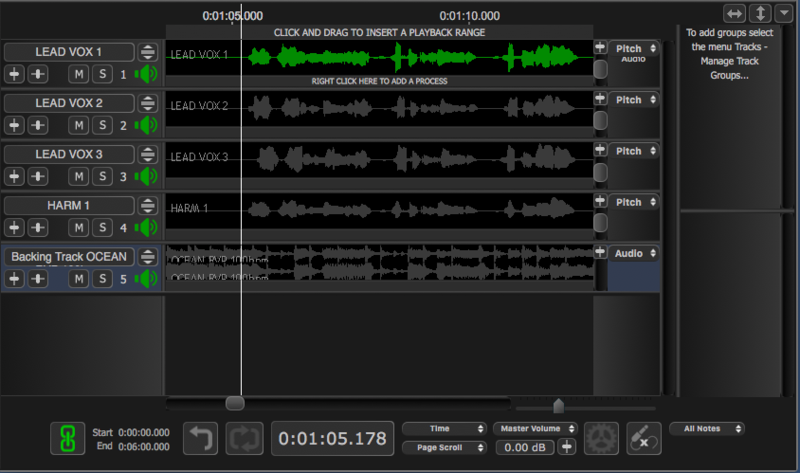 Press the "Add" button in the "New Audio Tracks" menu (above) to create the 3 new automatically numbered Output tracks (1, 2 and 3) under HARM1 as shown at the bottom of the image below. 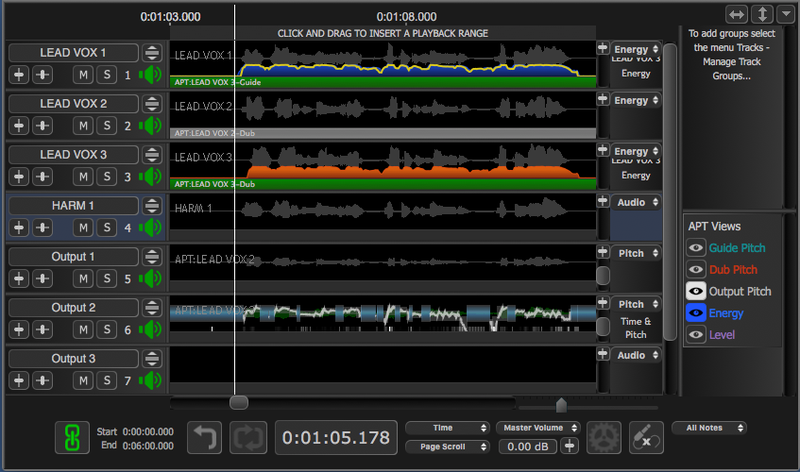 TIP: In picture above, we have fit all the tracks into the Session window. To do this, hold the SHIFT key down, select a track separator line under any track and drag the separator upwards to reduce the heights of ALL the tracks together to fit in the Session window, as shown in the image. RIGHT CLICK in a Process Control track to bring up the menu and select New APT. 5. Check that the selections in the New Process window are correct and change ones that are not. Initial Input Start and End: "Selected Audio". Inputs Guide: "Lead Vox 1". Inputs Dub: "Lead Vox 2". If "Output3" is shown selected as the Output because it was the last added Output track, it would be wrong for this procedure and should be set to "Output 1" as described below, to make it the 1st Output track. 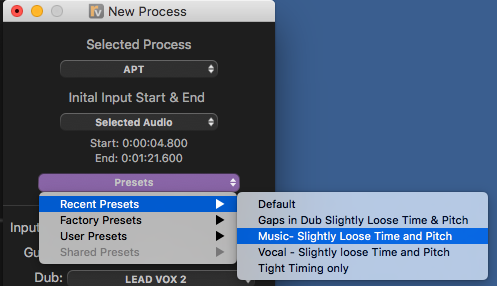 As shown in image at right, Presets has been clicked and the menu setting "Music - Slightly Loose Time and Pitch" has been selected for this example. If a Preset is not selected, the "Default User Preset" will be selected. The processing setting for each individual APT can be modified later as well. Use the "Output" drop down menu to select the track that will receive the first of the multiple APT outputs. Example: Note in the first image above of the New Process window, the track labelled "Output 3" was selected (because it was the last new track created). 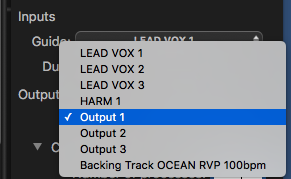 But we want the first APT Output from the track labelled "Lead Vox2" to go to the track labelled "Output 1". In the figure shown right, we have clicked in the Output dropdown control and selected the track "Output 1", which will be shown in the next image below as the first selected Output track. In the New Process window, click the triangle next to "Create Multiple Processes" to show the fields "Number of processes" and "Dub Track Increment" and set these two fields as shown below. "Number of processes" - has been set to 2, to create one APT for each of the two Dub inputs. "Dub Track increment" - has been set to 1, because the second Dub input (Lead Vox 3) is one track below the first Dub input ("Lead Vox 2"). Click the Output "Fix Offset" tick box to maintain the offsets between each Input Dub Track and the APT Output Track. Example: As shown in image at right, once Fix Offset is set ON, the text next to Output shows "Dub+3". This means that each APT Output will be sent to the track 3 tracks below each corresponding Dub Input Track. This will be shown executed in the next step. TIP: Before creating the New Processes, make sure that one of input audio regions is selected (green) (as shown in the figure in Step 4) to ensure that the range of the audio to process is specified correctly. Create the new Processes by pressing the keyboard "N" key or clicking the "New Process" button. 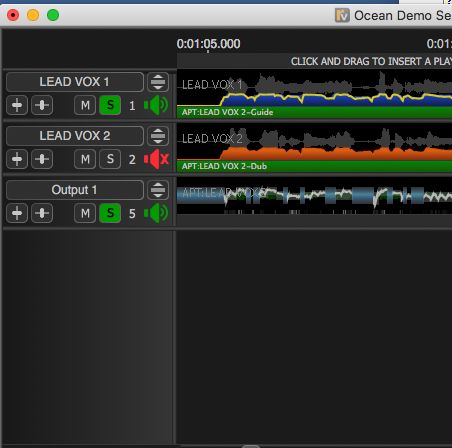 Example: As seen below, two APT processes have been created, which use "Lead Vox 1" as the Guide input. The Process Control Blocks are all the length of the audio that was initially selected. 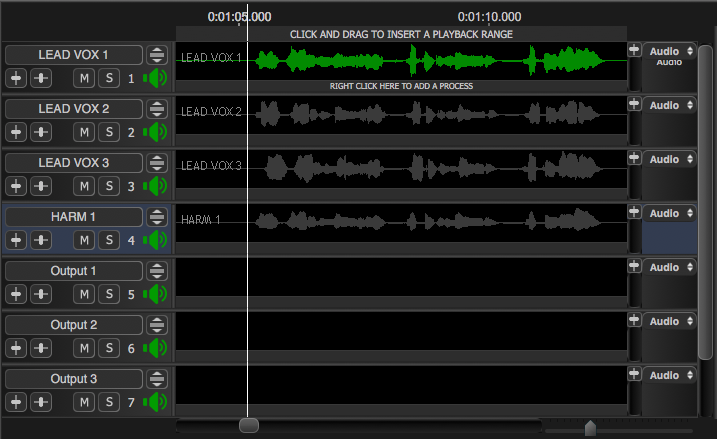 The Dub Process Control Blocks have been inserted (with 1 track spacing) into Tracks Lead Vox 2 and Lead Vox 3. 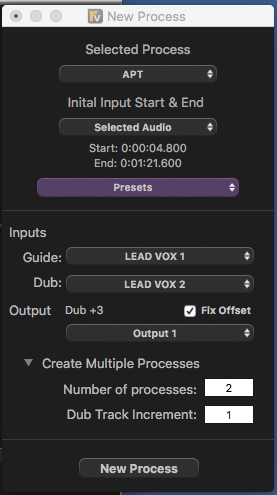 Two Output tracks have been created in the Output tracks "Output 1" and "Outupt 2" which are 3 tracks below each APT process Dub Input track (Lead Vox 2 and Lead Vox 3). Do this by clicking an Output, or a Dub Process Control Block, (or select a Guide process control block). Then you can press the keyboard P key (or click the black triangle in a Process Control Block if visible - (they are NOT shown in the screen above) and the APT control panel, as shown below, will appear. a) Change the processes settings to what is desired, and save these as the Default User Preset. b) Then, use UNDO commands until you UNDO the insertion of the multiple Processes. c) Then return to Step 9 and recreate the processes. OR just change the settings for each APT one at a time. TIP: To set up auditioning of just the multiple Outputs with the Guide Input, if the track count is under 10, you can press the keyboard numeric keys to toggle the solos on (or off) for tracks 1, 5 and 6, or any other combinations. For tracks with number above 10, then you can click the Solo or Mute buttons in the Track. However, to hear one APT at a time, the Process-based Solo switching will be effective for any number of tracks. By selecting either a APT Process' output audio or an APT's Dub Process Control Block then, use the Quick Solo Keys, G, D, A, E, F or G described in detail here, the Inputs and Outputs of that APT can be Soloed in any combination. 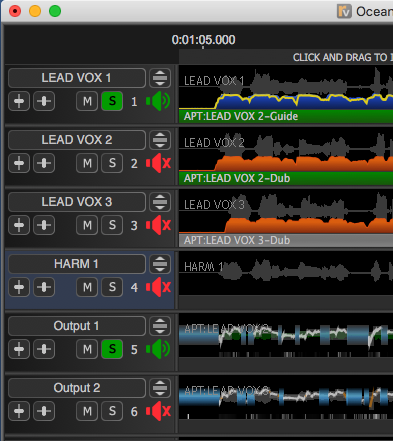 For example, in the image right (where APT Lead Vox 2-Dub is selected) the E key on the keyboard Solos the Guide Input (In track 1) and the Output 1 in track 5 containing the processed APT Lead Vox 2-Dub. TIP: Reminder - How to view only the Tracks of one APT. When the APT input and output tracks are spread out in a session as shown above on the left, one way to help audition and work with one APT at a time is to focus in on the APT. To do this, select either the Dub Process Control Block or Output audio of the APT of interest, and press Z on the keyboard. This will hide all tracks except the Input Guide, Dub and Output tracks for that APT process, as shown right. If you want to increase the height of the shown tracks, also select the commend Tracks /Auto Size Track Heights or drag the bottom of one track while holding down shift. Pressing X restores all the processes to view. Click here for more details. 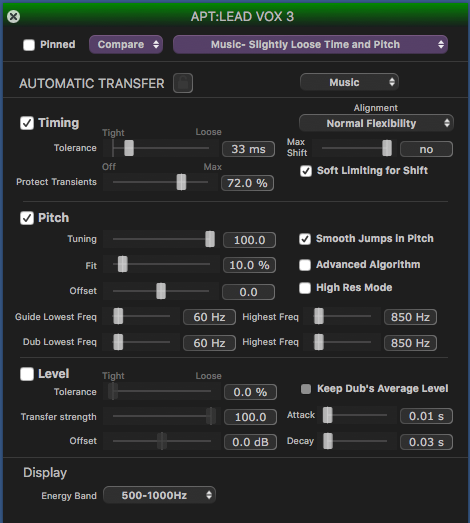 TIP: If the pitch traces are not shown, the slider at the right of each track can be moved to locate the pitch trace and optionally pressing SHIFT allows all pitch traces to be moved together. It is important to remember that the APT audio, energy, pitch, and signal level displays can be controlled in the APT Views control panel and track display controls. Click here to return to that topic.